The original Bomberman was a puzzle-like maze based video game franchise that was developed by Hudson Soft. The goal was to defeat a plethora of enemies by strategically placing bombs around the screen to blow them up. As with Mario or Donkey Kong, Bomberman is a character that has been around from almost the onset of video gaming and every now and then the character returns to grace the latest console system around. The main game mode is the Bomberman mode where you can play single player or multiplayer and you run around picking up things to help you and dropping bombers to destroy blocks and other players. It’s a formula which has worked for Hudson for almost twenty years and still continues to work. The game is so simplistic yet addictive, and is definitely a strong case for gameplay over graphics. 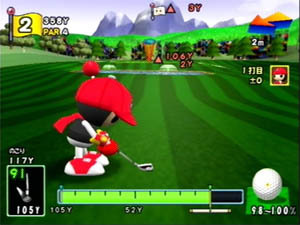 The other section of the game contains three sports games which include baseball, golf and tennis. The games do have some elements of Monkey Ball in that they aren't overly realistic but in an interesting twist they have stats on the level of something like an EA game which is a little strange considering simplistic gameplay of previous Bomberman games. Graphically, Bomberman features the traditional Bomberman graphics but it has been slightly updated for the 21st century but don't expect too many awards here, especially for those of lovers of visual candy. 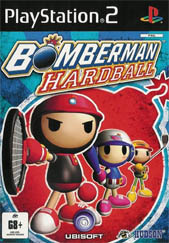 From traditional top-down views to more modern 3D views for Bomberman sports, the graphics contain cute polygon models with awesome colour texture details that lends itself well to this title. As with the graphics, the sound effects appear to have been taken out of the original titles that feature all the yelps and explosions of that old classic. 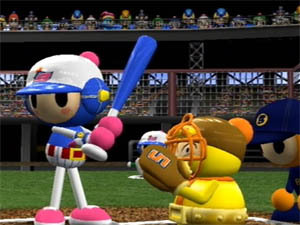 In conclusion, Bomberman Hardball is an addictive game that I'm sure fans of the original series will simply adore, although nothing special in terms of gameplay, the game does have enough to keep it going with awesome replay value, cute graphics and a healthy dose of addiction. Go Bomberman!